This week it has been reported that the construction of HS2 would lead to a ‘huge number’ of weekend closures on the rail network, but the Department for Transport has produced a more recent figure, higher than what is being reported. The number of weekend closures HS2 Ltd claim would happen to build Phase 1 is 183, but the DfT put it at 223. This figure still masks the real levels of disruption the project would cause to the transport network, which includes a 16 year period to rebuild Euston station in two stages and significant disruption to the strategic road network. Whilst HS2 Ltd updated their information paper “D12: Track Possessions for HS2 Phase One Engineering Work” on 1st June, just a month later on 2nd July the Department for Transport, in their response to a report on HS2 from the House of Lords Economic Affairs Committee (See Figure 2.10, Page 24), claimed the true figure for Phase 1 weekend rail closures would be 223, with another 163 needed for Phase 2, bringing the total number of weekend closures required for the entire project up to 386. The figure used by HS2 Ltd has long been criticised as highly optimistic, as despite document D12 now being on its’ third iteration, the quango has consistently insisted that despite the fact a new bridge for HS2 would have to be built over the West Coast Mainline next to Berkswell Station (between Coventry and Birmingham International), no associated closures of the line would be required. However, as the DfT figure does not provide any breakdowns, it is impossible to know which lines will be subject to the additional 40 weekend closures related to Phase 1 of HS2. Additionally, though the current figure of 4 weekend closures to put HS2 under the current Coventry-Leamington line is double the original estimate, it still stands out as significantly lower than other estimated line closures. 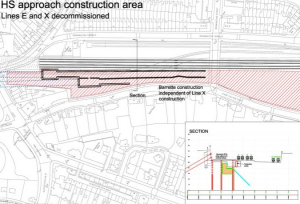 Oh yeah, HS2 Ltd intend to decommission two of the lines into Euston station, for as yet unspecified period of time. It is also the case that neither body are telling the full story in terms of transport disruption, as whilst HS2 Ltd state the need to close Euston Station for 19 weekends, they do not mention the fact that two of the current approach lines, lines ‘E’ and ‘X’ are due to be decommissioned, which will have a significant knock-on effect on all services every day of the week coming in and out of Euston. This point has been validated by the Office of Rail and Road (formerly the Office of Rail Regulation), who when they granted GNWR permission to run additional services from Blackpool to London from 2018 last month, said the service would have to terminate at Queens Park due to a lack of line capacity running into Euston during HS2 construction. HS2 Ltd are expected to publish ‘Additional Provision 3’ later this month which will detail part of the redesign for Euston. It seems this will only be half of the story, as because they are running out of time to get the design in to the committee of MPs currently looking at the proposals, their plan as presented to local residents last month is to redesign Euston in two parts, with some of the design changes to the station being covered in the current Phase 1 Hybrid Bill, and others in the Phase 2 Bill. This will mean disruption for passengers using Euston for 16 years from 2017 to 2032, and construction above the station will continue even after that. 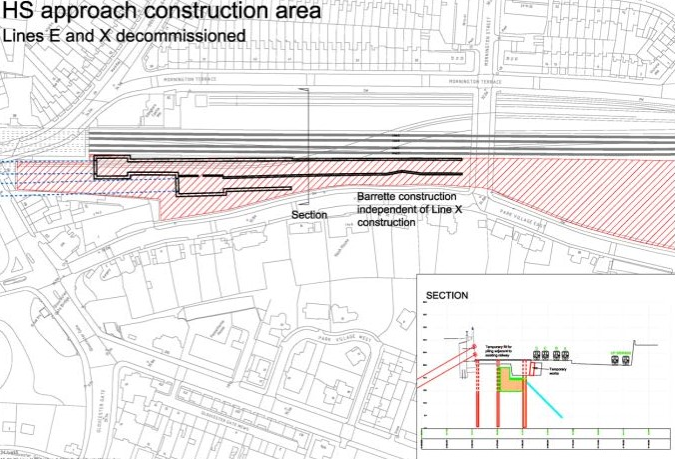 The current timescale shows that work on Phase 1 of the Euston works will begin before around three years before work to design Phase 2 starts. These plans will represent the fourth and fifth iterations of the Euston redesign from HS2 Ltd. The Department for Transport say alternatives to HS2 would be more disruptive claiming they would require 14 years of weekend rail closures, despite the fact much of that work would not require the same level of possession of the railway and could be done overnight. The competence of the DfT in producing these figures has to be questioned, as in their response to the Lords EAC, they actually claimed the ‘optimised alternative’ upgrade rail package would lead to a loss of 155 miles of double-tracked railway. The DfT also handily ignore the fact the rail alternatives would not impact on the road network, whilst the need to build crossings and move roads will mean HS2 will have a significant impact on strategic roads such as the M1, M6, M42, A45 and A46. Pingback: Euston Rebuild Will Mean 2 Decades of Horrendous Chaos on West Coast Mainline.